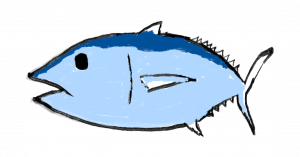 Are you looking for information on the poem “Ode to Large Tuna in the Market” by Pablo Nerudo? If so, you’ve come to the right place. In this article, we will take a look at a summary of the poem, an analysis of the meter, rhyme and idioms, and then we take a look at the poem itself. You can also learn how to write your own poetry explication. “Ode to Large Tuna in the Market” is about the author walking through the market and seeing a variety of different vegetables but only one fish, and the fish is what catches his eye and admiration the most. He goes on to brag about the greatness of this fish, the tuna. This contemporary poem is easily understood and is about a situation most of us have been in–walking through a market. There is no hidden meaning to this poem, it is clear as day. The author admires the fish for what it has done. He imagines the fish’s life in the ocean and, at least somewhat, seems to envy it when it was alive. This poem is made up of four stanzas of varying lengths without any purposeful rhyme scheme or meters (although we should keep in mind that this poem was originally written in Spanish and this is only a translation). In the first stanza, the author introduces the tuna. He calls it a “torpedo” and a “missile”. The tuna is lying dead in front of him. The second stanza starts by speaking about how the fish is surrounded by green vegetables but then begins talking about how the tuna is the only one at the market to see the deep dark depths of the ocean. The final stanza starts with a comparison to the market table to the fish’s coffin and goes on to speak about the fish’s once youthful and energetic life as much as being compared to a “sappy as a sprung fir / in the green turmoil, / once seed to sea-quake, / tidal wave”. He says the tuna is the “only shape left / with purpose or direction / in this / jumbled ruin / of nature”. These lines indicate that the author feels the other “shapes” don’t make sense. He feels that everything else is lost and doesn’t fit well with nature. This interpretation can be backed up by looking at the next lines: “you are / a solitary man of war / among these frail vegetables”. There we see that the author feels the shape of the fish is fit for “war” while the vegetables are just frail and useless. He continues by calling the fish a “well-oiled ship of the wind” and the “the only / true / machine / of the sea”. It is possible to interpret this poem to mean that Neruda feels like a useless vegetable and that he envies the fish greatly, wishing he were free and could swim the ocean as the fish once did. However, I think that may be pushing the limitations of interpretations just a wee bit. Instead, I think this poem is best to be left up to be an “ode” as the title states and to look at this as simply admiration for the great fish of the sea. catafalqued king / of my own ocean – The dead “king” (the tuna) is displayed in front of him in the market as if it is the fish’s coffin in the author’s ocean (the market or just land). the only / true / machine / of the sea – The most well designed creature. Someone recommended “Ode to Large Tuna in the Market” because they found it funny. They said that there were many hilarious lines throughout it. However, I just didn’t get that impression. Is it silly? Perhaps. Did it make me laugh? No. Although I do appreciate this piece quite a bit. There is a lot to it. It makes me think about the fish, the market, and even the shapes and sizes of each of the vegetables. It is a thought-provoking piece in a weird kind of way. In all honesty, I would say that this is one of my favorite poems that I have read recently. It is easy to understand and there is actually a nice smooth flow that makes it easy to read. I think this poem would be perfect for a classroom full of middle schoolers or even high schoolers.